A drop in prices followed by an immediate two-day run up in precious metals boosted sales of United States Mint platinum and gold coins. On top of that, the release of Fort McHenry Quarters Three-Coin Sets sparked sales across a range of America the Beautiful Quarter products. The newest sets were the third best-selling product for the Mint. This week’s U.S. Mint sales report included the new quarters set and updates to 201 others. Out of the older products, 91 outperformed their prior weekly sales compared to the 62 noted in the last report. Ten logged unit sales of more than 1,000 versus 9 previously. Demand picked up for bullion gold coins but dropped a bit for bullion silver coins. 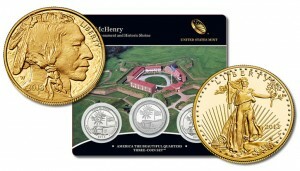 The following grid offers weekly and monthly sales for all U.S. Mint bullion products. The weekly period covers sales from Sept. 19 to Sept. 25, 2013. These tables show the latest sales for U.S. Mint numismatic products. The sales period covered is from Sept. 16 to Sept. 22, 2013. Products with an asterisk (*) are no longer available. Big jump in sales for the 2013 W burnished Uncirculated Silver American Eagle compared to previous weeks. Will it be a lower mintage year than last year? Hi Joe that is a good question but very hard to answer. I can only give you my opinion for an answer. If sales continue to be 6,000+ a week for the rest of the year or for as long as they sell them then it will end up being a higher mintage than 2012. The UNC dollar set has not been released yet so that will drive the number higher. The number will never be as high as the bullion version but only time will tell on the final mint number for the burnished coin. Thanks Keith for the answer. I forgot about the unc dollar sets that have not been out yet. That could make them a higher mintage than last years with or without the dollar sets. You’re probably right. I’m hoping for the 2013 W Uncirculated to be a lower mintage than the 2012 W. uncirculated so they will be more collectible than last years. Yes I do as well, I still have mine in the shipping box to keep them qualified as First Strike coins per PCGS standards. The UNC set will probably send the mintage higher than last year because of the added premium to last years graded UNC set because of the low amount of sets made. All we can do is wait and hope the numbers stay low.